Mihaela Ion is a partner at Popovici Nițu Stoica & Asociații and the head of the competition practice group. Her area of expertise covers in particular antitrust litigation, unfair trade practices, consumer law, merger control proceedings and state aid. She also assists clients in structuring and implementing compliance programmes, providing regular training as external legal counsel on all relevant aspects of competition law. Chambers Europe reported Ms Ion as having ‘great expertise in antitrust investigations and wider competition law’. Ms Ion holds a degree from ‘Lucian Blaga’ University of Sibiu and is a member of the Romanian Bar Association. 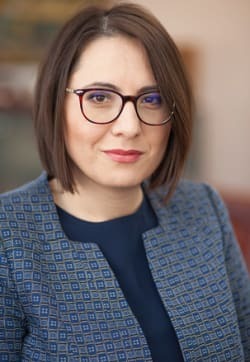 She also holds a master’s degree in European and international business, competition and regulatory law from Freie Universität Berlin, a master’s degree in competition from the Bucharest Academy for Economic Studies and a master’s degree in international relations and European integration from the Romanian Diplomatic Institute.